Politics will be the primary focus for markets during this "big week" full of potentially major developments, with the US midterm elections at the forefront. President Trump is also due to meet with France's Macron and Russia's Putin, while in Germany the CDU party retreat may provide an update on future leadership. 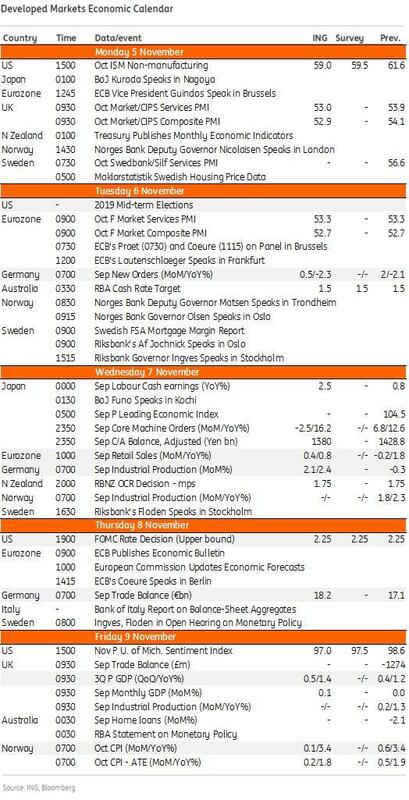 We've also got a Fed meeting, global PMI data, US PPI, China trade and inflation data, and more corporate earnings scheduled. As DB's Craig Nicol writes, "there's little doubt that the big event next week for markets is the US midterm elections on Tuesday." As Deutsche Bank previews, polls and betting markets indicate that the Democrats are likely to take control of the House, while the Republicans are likely to retain Senate control. The major issues for voters are healthcare, immigration, and trade policy. For markets, the key issues are whether to expect further fiscal stimulus, and what the implications are for trade policy. On the former, unified Republican control is likely more bullish, while on the latter, a divided government could de-escalate the current trade conflict. A busy week for the President will also see him travel to Paris on Friday along with Secretary of State Michael Pompeo, where they will meet French President Macron and Russian President Putin. Away from that it's worth noting that the German CDU party begins a retreat this weekend ahead of a convention in December to elect Merkel's successor. A news conference is scheduled following the completion of the retreat on Monday. Other potentially interesting political events next week include Chinese President Xi Jinping addressing China's first International Import Expo on Monday, Euro Area Finance Ministers meeting on Monday in Brussels with Michel Barnier also due to deliver a Brexit speech on the same day, Russian PM Medvedev meeting with Chinese Premier Li Keqiang on Wednesday and EU Foreign Affairs Ministers meeting on Friday to discuss the WTO and trade in Brussels. For the Fed on Thursday, no change in policy is expected and with this also being a meeting which doesn't include a press conference from Fed Chair Powell, it's hard to envisage there being much in the way of new information for the market, especially with recent data still supportive. That being said the recent market selloff and subsequent impact on financial conditions is something which could perhaps be addressed. As a reminder, DB expects a 25bp hike at the December meeting. As far as data releases are concerned, with it being a FOMC meeting week it's fairly quiet in the US however we will get the October PPI report on Friday which should be a focus. Prior to that we'll also get the final October services and composite PMIs on Monday along with the October ISM non-manufacturing print, JOLTS job openings for September on Tuesday, September consumer credit on Wednesday and the preliminary November University of Michigan consumer sentiment reading on Friday. In Europe the final October services and composite PMIs on Tuesday will be closely watched as will September industrial production prints for Germany and France on Wednesday and Friday respectively. In the UK the preliminary Q3 and September GDP prints on Friday should be the main focus. Finally in Asia we've got the PMIs on Monday for Japan and China along with China trade data for October on Thursday and then the October CPI and PPI prints on Friday. In EM land it'll be worth keeping an eye on Turkey's latest CPI report on Monday which is expected to stay elevated at just below 25%. Meanwhile it's a fairly quiet week for Fedspeak next week. The only scheduled speakers at present are those on Friday when Quarles, Williams and Harker are due to speak. Over at the ECB we're due to hear from Guindos on Monday, and Praet, Coeure and Lautenschlaeger on Tuesday. The BoJ's Kuroda is also due to speak on Monday. Last but by no means least, next week we've got 76 S&P 500 companies due to report as we edge closer to the end of earnings season. Some of the highlights include Walt Disney, Qualcomm and CVS Health. Some of the global earnings releases next week include SoftBank, Credit Agricole, Unicredit, BMW, Toyota and Petrobras. Monday: The final services and composite PMIs for October in Japan, China, UK and the US should be the main focus datawise on Monday. Away from that we'll also get the November Sentix investor confidence reading for the Euro Area and October ISM non-manufacturing print in the US. The BoJ's Kuroda, and ECB's Guindos are also due to speak while Euro Area finance ministers are due to meet in Brussels. EU Chief Brexit negotiator Michel Barnier is also due to deliver a Brexit speech in Brussels, while China President Xi Jingping is due to address the country's first International Import Expo. Monday also marks the day that US sanctions on Iranian oil flows go back into effect. Tuesday: The big focus on Tuesday will be the US midterm elections. Away from that, data releases include the final PMIs in Europe (services and composite readings), German factory orders for September, Euro Area PPI for September and JOLTS job openings in the US for September. The ECB's Praet, Coeure and Lautenschlaeger are all due to speak. Wednesday: It's a quieter day for data Wednesday. In Japan we'll get September cash earnings, in China we'll get October foreign reserves, in Europe we'll get September industrial production in Germany and September retail sales for the Euro Area, while in the US we'll get September consumer credit. Away from that the BoJ's Funo is due to speak, while Russian PM Medvedev is due to meet Chinese Premier Li Keqiang. Thursday: The main focus on Thursday will be the Fed with the FOMC meeting. Away from that we're due to get October trade data in China, September trade data in Germany and France and the latest weekly initial jobless claims print in the US. The European Commission will also update its economic forecasts, while the ECB's Coeure is due to speak. Friday: It's a busy end to the week for data on Friday. In China we get October CPI and PPI. In Europe we'll get September industrial production in France and the September and Q3 GDP prints in the UK. In the US the highlight is the October PPI reading, while the preliminary November University of Michigan consumer sentiment reading and September wholesale inventories are also due. The Fed's Quarles is also due to speak along with the Fed's Williams and Harker, while President Trump travels to France to meet French President Macron and Russian President Putin. European Foreign Affairs Ministers will also meet to discuss the WTO and trade. 10:00 AM ISM non-manufacturing, October (GS 58.6, consensus 59.1, last 61.6): Given softer service-sector surveys and stock market weakness, we expect the ISM non-manufacturing index to decline by 3.0pt to 58.6 in the October report, after reaching a cycle-high in September. On net, our nonmanufacturing survey tracker – which is scaled to the ISM non-manufacturing index – fell by 2.7pt to 56.6. 10:00 AM JOLTS Job Openings, September (consensus 7,125k, last 7,136k); The August JOLTS report showed that both job openings and the quits rate are at cycle highs. 08:30 AM Initial jobless claims, week ended November 3 (GS 205k, consensus 214k, last 214k); Continuing jobless claims, week ended October 27 (consensus 1,635k, last 1,631k); We estimate jobless claims declined by 9k to 205k in the week ended November 3, following a 2k decrease in the prior week. Claims still appear somewhat elevated in states affected by Hurricane Michael, and claims typically increase in the weeks following the week of the hurricane but subsequently decline. 02:00 PM FOMC statement, November 7-8 meeting: As we discuss in our FOMC preview, we do not expect any change in the funds rate. In the post-meeting statement, we think the committee is likely to retain the upbeat tone of recent meetings, with small changes to the overall language. Despite recent financial conditions tightening due to recent stock price declines, we do not expect any changes to the language on financial developments, which the statement already lists as one of the factors the committee assesses in the policy outlook. The recent tightening of financial conditions has increased the risk that growth slows to a trend pace earlier than the end of 2019. We now therefore see the risks around our Fed call of five more hikes through the end of 2019 as symmetric. There is still a significant risk of a longer or steeper hiking cycle, but this is now balanced by a risk of a shorter cycle or an extended pause. 08:30 AM PPI final demand, October (GS +0.2%, consensus +0.2%, last +0.2%); PPI ex-food and energy, October (GS +0.2%, consensus +0.2%, last +0.2%); PPI ex-food, energy, and trade, October (GS +0.2%, last +0.4%): We estimate a 0.2% increase in headline PPI in October, reflecting relatively firmer core prices and higher energy prices as well. We expect a 0.2% increase in both core measures of PPI, reflecting a continuation of the average recent trend in producer prices. 08:30 AM New York Fed President Williams (FOMC voter) speaks: New York Fed President John Williams will deliver welcome remarks at the Investing in America’s Workforce Book Launch Event. 09:00 AM Vice Chairman for Supervision Quarles (FOMC voter) speaks: Fed Vice Chairman for Supervision Randal Quarles will speak on stress testing at an event at the Brookings Institution in Washington. Moderated Q&A is expected. 10:00 AM Wholesale inventories, September final (consensus +0.3%, last +0.3%); 10:00 AM University of Michigan consumer sentiment, November preliminary (GS 99.0, consensus 97.9, last 98.6): We expect the University of Michigan consumer sentiment index to edge up 0.4pt to 99.0, potentially reflecting a pre-election boost. Other indicators of consumer confidence, such as the Conference Board measure, also suggest an increase for the index from its October level. The report’s measure of 5- to 10-year inflation expectations stood at 2.4% in October.